Martin was described as "the last link to Dixie"
The last surviving widow of a US Civil War veteran has died - nearly 140 years after the conflict ended. Alberta Martin passed away aged 97 at a nursing home in Alabama on 31 May after suffering a heart attack. In 1927, she married the 81-year-old war veteran of the Confederate army, William Martin, when she was 21. After living in poverty and obscurity for much of her life, she later achieved prominence, regularly attending Confederate parades. "She was what we call the last link to Dixie," Dr Kenneth Chancery, Martin's caretaker, said. "The war hasn't been that far removed, particularly for southerners, and she reminded us of that," he said. Martin had already been widowed with a son when she met William Martin, also a widower who had served with the 4th Alabama Infantry Regiment during the siege of Petersburg in 1864-65 and had a $50-a-month pension. The two lived on the same road in Opp, Alabama, and soon a marriage of convenience was born. Ten months later the couple had a son, also called William. He survives Martin. Soon after her husband died in 1931, Martin married his grandson, Charlie Martin. He died in 1983. In her later years, the daughter of a sharecropper became the belle of the modern-day buffs of Confederate history, appearing at their rallies and parades. "She was a link to the past. People would get emotional, holding her hand, crying and thinking about their family that suffered greatly in the past," Mr Chancery said. 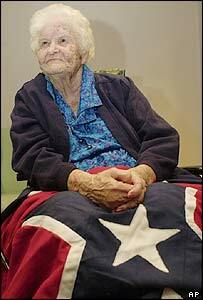 The last widow of a Union veteran, Gertrude Janeway, died last year in Tennessee aged 93.